Every time your heart beats it pumps blood to the rest of your body through arteries. Blood pressure is created by the force of blood against the artery walls. If it is consistently too high, it puts extra strain on your heart and blood vessels. This may increase your risk of a heart attack, heart failure, stroke and other conditions including kidney disease and dementia. Sometimes high blood pressure is caused by another health problem you already have. But most of the time there’s no obvious cause. Certain things are known to increase your risk of high blood pressure, including being overweight and not eating a healthy diet, or having a relative with high blood pressure. Three out of 10 adults in the UK have high blood pressure. You’re more likely to develop it as you get older. High blood pressure has few obvious symptoms. But it can be identified by regular checks and treated through changes to your lifestyle as well as medication. You may want to see your GP if you get a combination of any of these symptoms frequently. They may indicate high blood pressure or something else that needs to be treated. Eye problems and nausea can be particular signs of very high blood pressure or increased pressure on your brain. The only way to know if you have high blood pressure is to have tests. It’s good to get your blood pressure checked at least every five years – spotting any problems as early as possible reduces the risk of complications. If your levels are borderline ‘high’ you may be asked to come back for regular checks to see if your blood pressure increases. You may get your blood pressure checked anyway if you have tests for another reason, like a smear test, or registering with a new doctor. If you’re taking certain medicines, for example oral contraceptives or hormone replacement therapy, or if you’re pregnant, your blood pressure will be checked regularly. You may also find that you can check your blood pressure using a machine in places such as your local pharmacy or gym. If you do this and are concerned by the result, contact your GP surgery for an appointment. They will be able to give a definite diagnosis, and arrange further tests and treatment. If you’re aged 40–74 and registered with a GP in England, every five years you’ll be invited for several health checks, including a blood pressure test. Where this happens depends on where you live. It could be at your doctor’s, in a mobile unit or a community venue like a leisure centre, school or church hall. The latest automated, digital devices make it quick and easy to check your blood pressure. You don’t need to get undressed unless you’re wearing a top with tight sleeves that you can’t roll up. The person measuring your blood pressure wraps a cuff round your upper arm, then inflates and slowly deflates it. While this is happening a sensor in the cuff works out your blood pressure from your pulse rate. If you have an irregular heartbeat, the digital devices may not take an accurate reading. Whoever’s doing your test might have to take a manual reading, use a stethoscope held against your arm to listen to your blood flow. Try to relax during the test. One in 10 people get ‘white coat hypertension’ – where the sight of a doctor makes you nervous and raises your blood pressure. Your overall blood pressure reading combines these and is shown as two numbers measured in ‘millimetres of mercury’. A reading of around 120/80mmHg is seen as healthy – above 140/90mmHg is considered high. It’s possible to have high systolic pressure but normal diastolic pressure – called isolated systolic hypertension. This is more likely if you’re over 60 and may increase your risk of heart disease. The treatment is the same as for hypertension. Your GP or nurse will probably check a high blood pressure reading several times during your appointment to see if it’s a one-off or your usual blood pressure. They may also want to take more readings over a longer period to work out your average level and make a definite diagnosis. These additional measurements can help indicate if high blood pressure has caused you any harm. They may give you a device to wear on your arm for 24 hours as you carry on normal activities. It will take your blood pressure roughly every 20 minutes during the day and once an hour overnight. This is called ambulatory blood pressure monitoring (ABPM). You may be more comfortable with a device that allows you to do your own tests. Your doctor will ask you to record your blood pressure every morning and evening for four to seven days. This is known as home blood pressure monitoring (HBPM). You can buy your own device for measuring your blood pressure at home. The British Hypertension Society tests devices that are available and validates ones that are suitable for use at home. You can find a list of devices they’ve validated on their website. Monitoring your blood pressure outside the surgery is often more accurate. There’s less chance of ‘white coat hypertension’ caused by the stress of seeing a doctor. If you have high blood pressure, your doctor will want to find out the reason for this. They will also want to see if it has done you any harm, or increased the risk of damage, especially to your heart or kidneys. They will ask about your family’s medical history, what medicines you take, and any physical changes you’ve noticed, such as muscle spasms or urinating more often. Information about your general health, weight, diet, exercise and drinking habits helps your GP make a diagnosis too. If your blood pressure is very high – over 180/110mmHg – or your GP suspects it’s caused by a serious condition, you may be referred for specialist tests. If there is no single, identifiable reason why you have high blood pressure this is called ‘primary hypertension’. If there is an underlying medical cause, you’ll be diagnosed with ‘secondary hypertension’. About five in 100 people with high blood pressure have secondary hypertension related to a medical issue. This is particularly likely if you’re under 40 and your blood pressure rises suddenly. The most common causes are pregnancy and kidney disease. If you have any of these conditions, you should have regular blood pressure checks. Treating the condition may reduce your blood pressure so you don’t need to take antihypertensive medicines. Both over-the-counter and prescribed medicines can increase your blood pressure. These include decongestant cough and cold remedies, anti-inflammatories, steroids and oral contraceptives. Illegal drugs such as cocaine, and herbal remedies that contain liquorice can also raise your blood pressure. 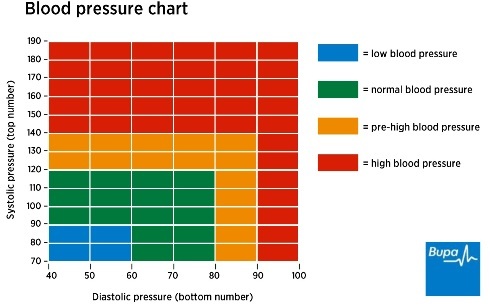 Your blood pressure – based on the readings taken – will be classed as stage 1 hypertension, stage 2, or severe. These also reflect the effect it has had on your body. Stage 1 may improve just by changing your lifestyle. Stage 2 needs medicines as well. Severe hypertension needs urgent treatment, usually by injecting medicines to lower your blood pressure as quickly as possible. There are some changes you can make to live more healthily, which may also help with reducing your blood pressure. Lose excess weight, especially fat stored round your waist. Do more activity, particularly aerobic exercise that gets your heart pumping. But get medical advice first – things like weightlifting and weight training can make high blood pressure worse. Eat less sugar and saturated fat. Fruit and vegetables are a source of polyphenols – there is evidence these help reduce blood pressure. So do oily fish rich in omega 3 fatty acids, such as salmon, sardines and mackerel. Add more calcium and potassium to your diet, including low-fat dairy products and beans, peas and nuts as well as green vegetables and bananas. But don’t take calcium, potassium or other supplements in an attempt to reduce blood pressure. Eat less salt. Try alternatives in cooking, like herbs and spices, and check processed food labels to find lower-salt varieties. Salt substitutes don’t help you get used to a less salty taste and can be harmful if you have certain medical conditions. Cut down on alcohol – stick to recommended guidelines and try to have at least two alcohol-free days a week. If your hypertension is mainly linked to drinking too much alcohol, it may disappear after a couple of weeks of complete abstinence. Drink less coffee and other caffeinated drinks like cola. It is unlikely that any one of these lifestyle changes will make a big difference to your blood pressure. But if you make an effort to improve all of them, you’re more likely to see results. Stress can temporarily raise your blood pressure. You may adopt unhealthy habits to cope with stress, like drinking more, which also affect your blood pressure. Learning to relax your body and mind can help. You may want to consider stress management, cognitive therapies or muscle relaxation techniques, for example. Your doctor can advise on some of these and possibly refer you for specialist therapy. Stopping smoking may not have a direct impact on your blood pressure, but it does reduce the risk of complications like heart disease and stroke. Just changing your lifestyle may not have enough impact on your blood pressure. But there are various ‘antihypertensive’ medicines that will also reduce it. They work in different ways like removing excess salt and fluids, slowing your heartbeat, or relaxing and widening blood vessels. It can take time to find the medicine that works for you and most people need to take more than one. Your doctor will probably prescribe each medicine —or combination of medicines — for at least four weeks. This gives it time to work and check you’re OK with it. Doctors are expected to follow specific steps and look at introducing antihypertensive medicines in the following order. There are various brands of each type. ACE inhibitors relax and widen blood vessels and reduce the volume of your blood. A few people may develop a persistent, dry cough and want to try a different medicine. Angiotensin-II receptor antagonists work in a similar way to ACE inhibitors, but without the cough. Calcium-channel blockers relax and widen your arteries so your heart receives a better blood supply and needs to do less work to pump it round your body. Thiazide diuretics act on your kidneys so there’s more water and salt leaving the body in your urine, and less excess fluid in your blood. This makes your heart pump more efficiently. Diuretics may not suit people with diabetes because they can increase blood sugar levels. Alpha-blockers stop the hormone adrenaline from narrowing your blood vessels. You may be prescribed them if you’ve tried other medicines and they haven’t worked. They aren’t suitable if you’re pregnant or have certain conditions, including Parkinson’s disease. You might need a medicine called spironolactone if other medicines aren’t working well. Beta-blockers haven’t been used as a mainstream treatment for high blood pressure for a while now, though in rare cases they may be used. They’re still commonly used for other cardiac conditions like angina, heart failure and atrial fibrillation. Most people with high blood pressure will need a combination of two or three medicines to control it well – not just the one. With some of these medicines you’ll need to have regular blood tests to check they’re not affecting your kidneys or potassium levels in your blood. It's important to keep taking your medicines. If you notice any possible side-effects, tell your doctor. Aspirin can be helpful if you’re at particular risk of developing heart disease. But your doctor may only recommend it once very high blood pressure is under control. Your doctor may suggest you regularly monitor your blood pressure at home as part of your treatment. In the UK one in three people with high blood pressure use an electronic device to take frequent measurements. This can show how treatment – including lifestyle changes and different medicines — is working. It helps you and your GP make decisions about trying something else, or possibly increasing or reducing medication. Seeing good results can encourage you to stick to your regime. Daily readings may help you spot things that make your blood pressure rise, like stressful situations. You should be told how to use the machine and what information to write down and share with your doctor. There are a variety of accurate home monitors available. Choose one validated by the British Hypertension Society. It is dangerous to ignore high blood pressure because it increases the chances of life-threatening complications at any age. The higher your blood pressure, the harder your heart has to work to pump blood round your body. This puts strain on blood vessels and can enlarge your heart, make blood vessels clog, burst or leak, and cause damage to your major organs. Stroke is the biggest risk overall. High blood pressure causes about half of strokes by blocking blood vessels or causing bleeding in the brain. High blood pressure is a particular issue if you have diabetes. Having both hypertension and diabetes increases the risk of kidney disease and cardiovascular disease. If you’ve ever had high blood pressure, you’re also more at risk of developing type 2 diabetes. Some antihypertensive medicines – including beta-blockers and diuretics – may add to this risk. If you have diabetes, you should get your blood pressure measured every year. Get it checked more often if it’s regularly over 140/80mmHg (type 2 diabetes) or 135/85mmHg (type 1 diabetes) and there’s any evidence of kidney, eye or brain damage. Your doctor may initially suggest lifestyle changes to get it below this level. You should have your blood pressure checked regularly if you’re pregnant. If you already have high blood pressure, or develop it during pregnancy, this can harm your baby and increases the risk of a condition called pre-eclampsia. This is a combination of raised blood pressure and protein in your urine. Rarely, it can develop into a very serious illness that can be dangerous for both you and your baby and requires urgent medical help. Complications include organ damage and problems with blood clotting. Some women develop high blood pressure a few days after giving birth (postpartum hypertension), particularly if they’ve had pre-eclampsia. This can result in serious complications such as stroke and needs careful monitoring, possibly in hospital. Antihypertensive medicines like diuretics may not be suitable if you’re breastfeeding. If you’re of African-Caribbean origin, you’re at particular risk of a certain type of hypertension. This makes your blood pressure rise because your body is more sensitive to salt and struggles to get rid of excess salt. Watch your salt intake carefully and try to reduce it if it’s high. People of south Asian (Bangladeshi, Indian, Sri Lankan or Pakistani) origin are also especially likely to develop high blood pressure. They tend to carry more weight around their waist – a big risk factor in primary hypertension. Why have I been given a 24-hour blood pressure monitor? Will it hurt? Why have I been given a 24-hour blood pressure monitor? Will it hurt? You need to wear a small digital machine on a belt round your waist and an inflatable cuff on your upper arm for the full 24 hours. You’ll need to avoid getting them wet. Some people don’t like the sensation of the cuff inflating and tightening against their arm. It can cause bruising. Because the device works all night, it may disturb your sleep. Why does my doctor keep changing my medicines? Why does my doctor keep changing my medicines? There are a variety of medicines that can lower blood pressure, and new ones are becoming available all the time. Not all of them may be right for you, if you have another condition, for instance, or develop side-effects. Your doctor should follow certain guidelines in trying different combinations, and think about what will do you the most good at the lowest possible dose. Medicines – especially combined with changes to your lifestyle like cutting down on salt and losing weight – may take a while to have an effect. In fact, a new medicine can take up to a month to take effect, so you may have to be patient. Don’t stop taking prescribed medicines without talking to your GP first. They will want to be sure your blood pressure is well under control and this can take years. The brand names of drugs can also change. It could be that the doctor has given you the same medicine, but it has a different name this time. Can I still drive if I have high blood pressure? Can I still drive if I have high blood pressure? You should be OK to carry on driving a car or riding a motorbike (group 1 entitlement on your licence). However, the medicines prescribed for your high blood pressure (hypertension) may cause side-effects that interfere with your driving. The Driver and Vehicle Licensing Agency (DVLA) can stop you from driving lorries and buses (group 2 entitlement) if you’re diagnosed with very high blood pressure of 180/100mmHg or more. The DVLA will probably relicense you once your blood pressure is under control, provided the treatment doesn’t affect your driving. It’s up to you to tell the DVLA about any condition that may reduce your ability to drive safely. You should also check your insurance to make sure you’re still covered after being diagnosed with high blood pressure. Map of Medicine. Hypertension. International View. London: Map of Medicine; 2015 (Issue 3).